1. The world occupied by all the celebrities in a particular field; such as, the theater or sports: Shirley was once a big name in the movie firmament. 2. The apparent surface of the imaginary sphere on which celestial bodies appear to be projected: In the firmament, different constellations or configurations of the stars and planets can be seen. 3. The vault or expanse of the heavens; the sky: When the children were young, a California family often went to the desert to enjoy the firmament at night. 4. 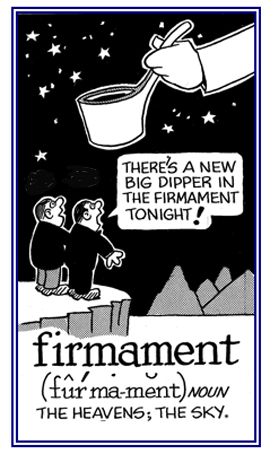 Etymology: from Latin firmamentum, "firmament"; literally, "a support or strengthening"; from firmus, "firm". © ALL rights are reserved. 1. A part that is broken off something or left when anything is shattered. 2. Something that is broken or separated into pieces or small parts. debris, useless accumulation of miscellaneous particles; waste in the form of fragments: "When the earthquake stopped, rescuers started to dig through the debris in search of survivors." rubbish, things that are no longer useful, or wanted, and that have been thrown out; trash: "Please pick up all of the rubbish that has been collecting in the back yard." rubble, broken pieces of stone, rock, etc. from walls or buildings that have fallen: "After the earthquake reduced the town to débris, rescue workers managed to pull some injured people out of the rubble." trash, things that are no longer useful or wanted and that have been thrown away; informal, something that is very low in quality: "Trash was scattered all around in his yard and he spent most of his time watching TV trash and even trashing his living quarters." 1. A group of people who have the power to make and enforce laws for a country or area. 2. A state and its administration viewed as the ruling political power. 3. The control and administration of public policy in a political unit. 4. The administration or management of an organization, business, or institution. 5. The management or control of something. 1. Clothes, especially clothing appropriate for someone's job, status, or for a special occasion: After cleaning up after the fire in her garage, Susan looked at the old habiliments she was wearing for the purpose and so she took them off and had a bath and put on clean clothes. 2. The equipage, paraphernalia, or trappings that are typical of a place: The tour that James and Jane were on included a walk through a TV studio with all the habiliments and equipment needed for broadcasts. © ALL rights are reserved. 1. Damage which results in a reduction of strength or quality. 2. A symptom of reduced quality or strength. 3. The act of making something futile and useless (as by routine). 4. The occurrence of a change for the worse. 5. The condition of being unable to perform as a consequence of physical or mental unfitness; for example, a hearing impairment. 6. A physical or mental defect at the level of a body system or organ. The official WHO (World Health Organization) definition is: any loss or abnormality of psychological, physiological, or anatomical structure or function. 7. 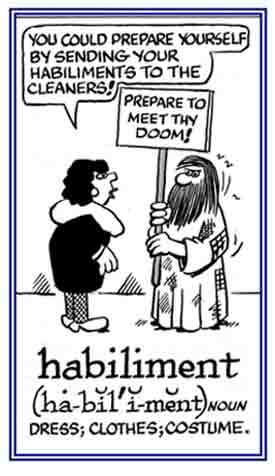 Etymology: from Middle English enpeire, from Old French empeirier, based on Late Latin pejorare, "to be worse, to worsen" (from Latin pejor, "worse"). 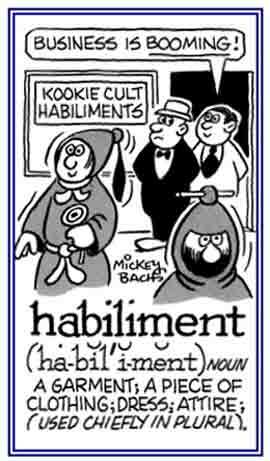 The current spelling is the result of an association with words derived from Latin beginning with im-, "thoroughly". 1. The act or process of improving. 2. The state of being improved. 3. A change or addition that improves. 1. The act of challenging something, or someone, as being false; such as, another's statements, motives, etc. 2. The process of casting doubts about. 1. Something that incites or provokes; a means of arousing or stirring someone or people to action. 2. An act of urging on, spurring on, or rousing to action: "They were charged by the police with incitement to violence." 1. Unpleasant with reference to being stormy, rainy, or snowy. 2. Showing little or no clemency or mercy; unmerciful. 1. The amount by which something increases to a greater number, quantity, degree, or an amount. 2. A process of becoming larger or longer or more numerous or more important. 3. An addition to or an increase in the amount or size of something; especially, one of a series of small, often regular or planned increases. Any violation of a right, privilege, regulation, law, rule, contract, etc. 1. The formal promotion of a person to an office or rank. 2. The act of putting on robes or vestments. 3. Money that is invested with an expectation of making a profit: "Marcos made an investment with the expectation of making a profit."